The in-game demo of Metal Gear Solid V: The Phantom Pain features an impressive array of technology, from Fox Engine's fantastic character models and dynamic weather effects to its day and night cycle and open-world locales. Oh, and also, you have the ability to attach a surface-to-air recovery balloon to a goat and send it flying toward your home base. Clearly, the engine's most impressive feat. Metal Gear Solid V: The Phantom Pain is a revenge story. Nine years after the events in Ground Zeroes, Snake wakes from a coma damaged and angry. His severed arm replaced with a mechanical prosthetic, shrapnel sticks out of his skull and his friend, Miller, is missing. Ten days into Miller's disappearance, Snake and Ocelot ride their horses through the Afghani desert in search of clues. Snake struggles with his new arm, finding great difficulty in simply reaching out to grab a canteen offered by his comrade. "Getting used to it?" Ocelot asks Snake, to silence. Ocelot points beyond a ridge line. Information regarding Miller's whereabouts lies ahead, and Snake needs to find him soon. "Put those nine years behind you and return as Big Boss!" Oceleot yells out to Snake, as they part ways and the mission begins. The open-world in The Phantom Pain allows Snake to tackle his objectives from any direction. Given a general location for information on on Miller, Snake pushes off toward a small collection of stone huts in the middle of the desert. There, a pair of enemies stand guard. Using the new "low profile" stealth, snake pushes his body off to the side of his horse allowing him to ride by the enemies without being spotted. After Snake dismounts his steed, we're shown Snake's returning ability to attract guard attention. With his mechanical arm, Snake can make noise – or "knock" – to lure enemies within his reach. This ability, I was told, can be performed anywhere and doesn't require Snake to be attached to a surface. Later, like in Ground Zeroes, Snake interrogates one of the guards, which adds valuable intel on his iDroid map. It's here we also learn about recruiting for Snake's army: The Diamond Dogs. Much like it was featured in Metal Gear Solid: Peace Walker, Snake can recruit by attaching a Fulton Recovery System to a knocked out or held up enemy. 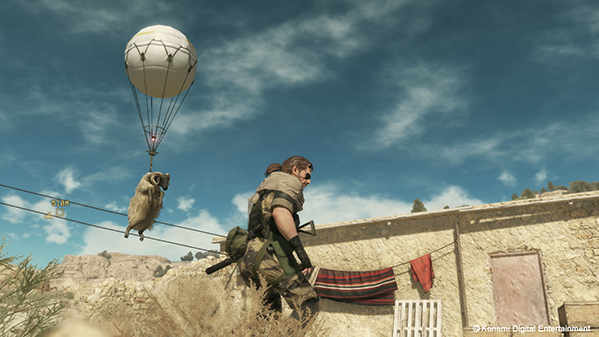 This system attaches a balloon to the enemy for pick up, so that they can be transported to the Diamond Dogs' headquarters, the Mother Base. Collecting recruits and objects is important in The Phantom Pain, as it adds to Snakes arsenal. As such, the system is a prompt and not a limited resource. For example, recruits can be assigned to scout for intel, giving Snake vital information on enemy position. 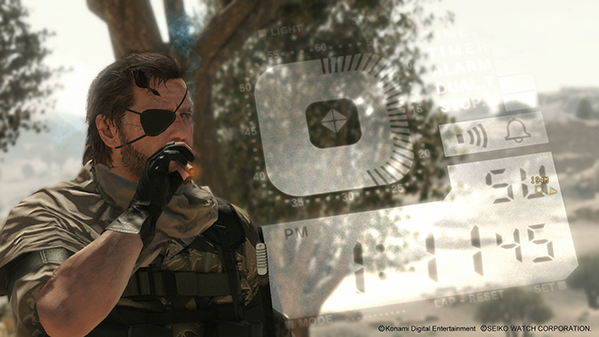 If you'd prefer to attack an enemy encampment during the evening, you can use Snake's new E-Cigar item, which can be used to adjust the time of day. Snake can also request supply drops for weapons and ammo – both of which can be ordered to land directly on enemy heads – and even create a Research & Development department within the Diamond Dogs ranks to craft vital equipment for the field, such as his legendary cardboard box. Yes, it has finally returned! Not only has the cardboard box returned, it has seen some serious technological upgrades. Snake can pop out the top of the box to surprise guards, and if he's spotted moving around in the contraption, Snake can jump out of the side of the box and leave it behind as a decoy for any investigating guards. Mother Base is a crucial element to The Phantom Pain, as it was in Peace Walker. The base is a physical location you can build, visit and defend from attack. The Kojima Productions team claims that every player's base will be different. Guards you've captured will appear here, and you can place artillery you've snatched from the battlefield. Setting up defenses is important, I was told, as the more enemies Snake creates throughout his adventure, the more likely his base is to be attacked. For the most part, the tools and mechanics available in Ground Zeroes are the core of The Phantom Pain. Alerts still snap the camera to the surprised guard giving you a moment to react, and Snake can still tag enemies throughout the environment. But the world of The Phantom Pain – which Kojima Productions says is two-hundred times the size of the one featured in Ground Zeroes – is more dynamic, with larger swaths of enemies and weather effects. Though it is open world, series creator Hideo Kojima says it still follows a mission structure to control the narrative doled out to players. Metal Gear Solid 5: The Phantom Pain is headed to Xbox 360, PS3, Xbox One and PS4. A launch date hasn't been announced.